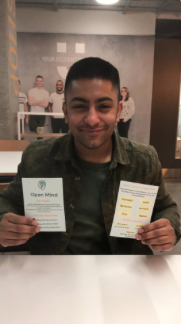 Saqib Mahmood, a student at The University of Manchester, has taken a year out from his course to become the wellbeing officer at the University of Manchester. However, it has been a far from an easy road for Saqib. The 23-year-old from Nottingham has a particular reason for having run for the role - the same reason he became an activist for mental health. Saqib was first exposed to mental health from the age of four when his dad was diagnosed with bipolar disorder. Traumatised by events he experienced growing up, he believes this is what triggered his own battle with mental health. In 2015, Saqib was diagnosed with bipolar disorder after suffering an episode of psychosis in his second year studying law. Sadly, a year later he relapsed after experiencing a second episode of psychosis, which led him being sectioned in Liverpool under the Mental Health Act. After having support from his brother and sister-in-law, who is an occupational therapist, Saqib was discharged from the psychiatric ward and took the courageous decision to return to university but to change courses. Reaching the end of his first year, Saqib felt it was his time to help others. The society has gone on to win two awards for Best New Society and also won the University of Manchester’s prestigious Social Responsibility Award. Statistics below for people diagnosed with bi polar in the UK. Saqib stresses that “peer support is the most important support you can get. If you don’t have a friend to talk to then, who do you have?”. A year later he campaigned for the role of wellbeing officer and succeeded after his genuine passion for the role came through loud and clear. “I was fortunate to have support and wanted to give that back to people. When you suffer and you can’t control yourself and the medication is the only thing controlling you, it’s the lowest form of belittling,” he said. Understanding that not everyone has the courage to speak to someone, he wants to develop more of an online platform such as the organisation that runs already ‘Big White Wall’, which is used by 400,000 students in the country. Statistics show that many people prefer to talk online about issues rather than face-to-face. His hopes for the future are as bright and positive as he is. From expanding his society to Manchester Metropolitan University, he now wants to achieve a communal support network where everyone can get involved and stop suffering in silence.